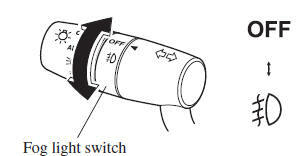 Use this switch to turn on the fog lights. To turn the fog lights on, rotate the fog light switch to the position. position before turning on the fog lights. The fog lights will turn off when the headlights are set at high beams. will turn on when the headlights, the exterior lights and dashboard illumination turn on.